The Lakeland Climbing Centre are delighted to have received a Highly Commended Visitor Attraction Award at the 2016 Cumbria Tourism Awards. This prestigious award puts the Centre straight through to the VisitEngland Awards for Excellence 2017, watch this space! The Lakeland Climbing Centre won a Silver Award in the Small Visitor Attraction of the Year category of the prestigious VisitEngland Awards for Excellence 2012. VisitEngland, the national tourist board responsible for promoting England both at home and abroad, has awarded the Lakeland Climbing Centre membership of its Visitor Attraction Quality Assurance Scheme (VAQAS). This makes us the first dedicated climbing centre in England to receive a VAQAS award and places us among an elite and diverse group of attractions such as The Natural History Museum and Woburn Safari Park. We will now benefit from VisitEngland’s promotional team marketing us to new audiences nationally and internationally. “On entering the Centre I was immersed in the large hall of climbing walls which creates a striking first impression. I was warmly greeted by a friendly member of staff who was well presented and offered clear instructions. The instructor provided clear information and offered excellent support, advice and encouragement which enhanced the overall experience. He was friendly, knowledgeable and polite. The Centre offered an exhilarating experience for all ages and levels of ability and offered a high level of customer services and facilities”. 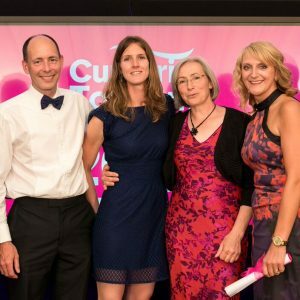 We were also one of fourteen Cumbrian businesses to receive an award for exceptional standards of quality and excellence in the tourism industry at the 2011 Cumbria Tourism Awards. ITV’s ‘Loose Woman’ Rachel Agnew presented Kate and Andrea with the Small Visitor Attraction of the Year Award at the celebratory dinner. We were finalists in two categories: Tourist Attraction of the Year and Training and Development. Again we were proud to get down to the last 12 finalists from hundreds of entries. We received Highly Commended in both categories.